Former SHSU football coach Ron Randleman was honored Feb. 23 as the Huntsville Item's 2004 Citizen of the Year. During a reception at the Walker Education Center, Item publisher David Lyons thanked Randleman for his contributions to the university and community since his arrival in Huntsville in 1982, and especially last year's record-setting season and playoff run. 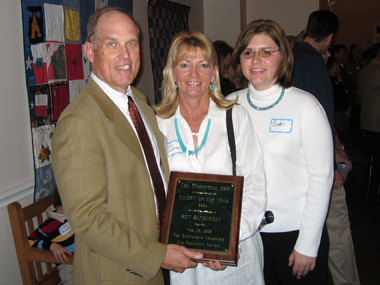 Shown with his plaque are Randleman, his wife, Margie, and his daughter, Mindie.